A newer version of this tutorial series is available, for Visual Studio 2013, Entity Framework 6, and MVC 5. 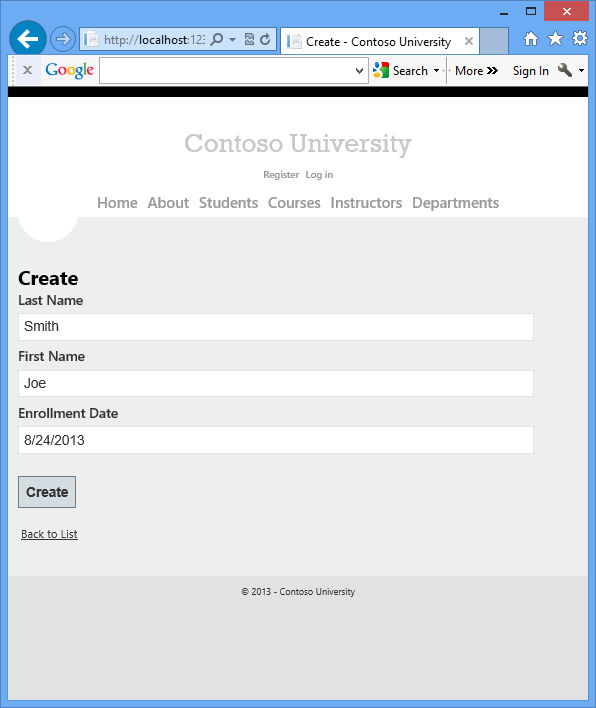 The Contoso University sample web application demonstrates how to create ASP.NET MVC 4 applications using the Entity Framework 5 and Visual Studio 2012. The sample application is a web site for a fictional Contoso University. It includes functionality such as student admission, course creation, and instructor assignments. 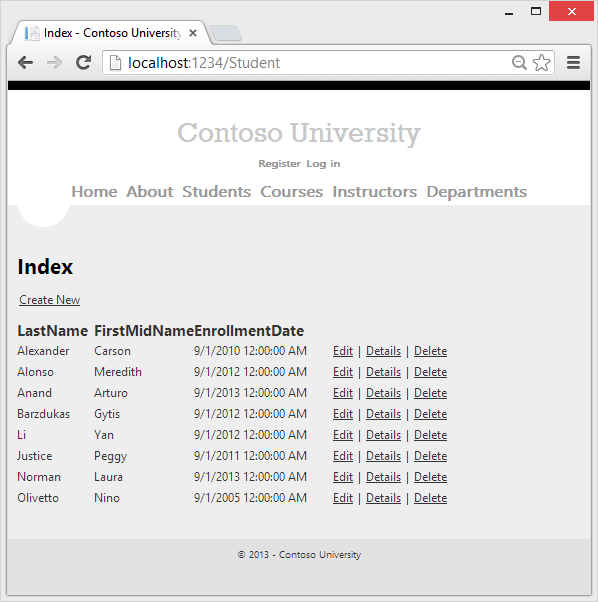 This tutorial series explains how to build the Contoso University sample application. You can download the completed application. There are three ways you can work with data in the Entity Framework: Database First, Model First, and Code First. This tutorial is for Code First. For information about the differences between these workflows and guidance on how to choose the best one for your scenario, see Entity Framework Development Workflows. 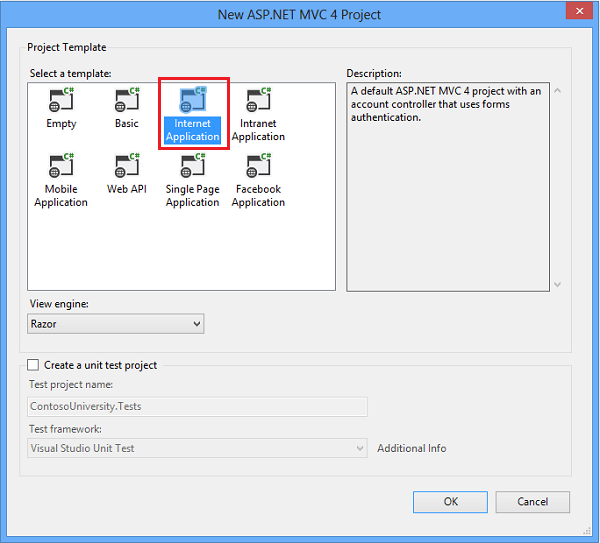 The sample application is built on ASP.NET MVC. If you prefer to work with the ASP.NET Web Forms model, see the Model Binding and Web Forms tutorial series and ASP.NET Data Access Content Map. Visual Studio 2012 Visual Studio 2012 Express for Web. This is automatically installed by the Windows Azure SDK if you don't already have VS 2012 or VS 2012 Express for Web. Visual Studio 2013 should work, but the tutorial has not been tested with it, and some menu selections and dialog boxes are different. The VS 2013 version of the Windows Azure SDK is required for Windows Azure deployment. .NET 4.5 Most of the features shown will work in .NET 4, but some won't. For example, enum support in EF requires .NET 4.5. Windows Azure SDK 2.1 If you skip the Windows Azure deployment steps, you don't need the SDK. When a new version of the SDK is released, the link will install the newer version. In that case, you might have to adapt some of the instructions to new UI and features. See the last tutorial in the series for acknowledgments and a note about VB. The original version of the tutorial is available in the EF 4.1 / MVC 3 e-book. 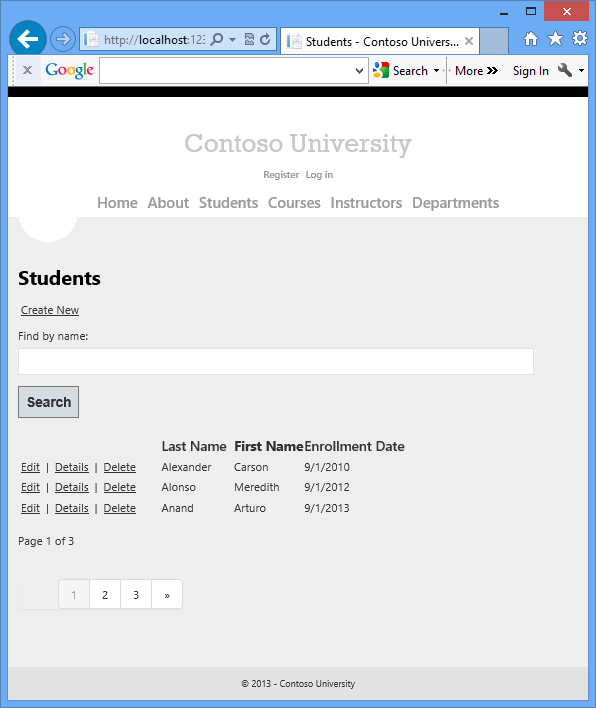 The application you'll be building in these tutorials is a simple university web site. Users can view and update student, course, and instructor information. Here are a few of the screens you'll create. The UI style of this site has been kept close to what's generated by the built-in templates, so that the tutorial can focus mainly on how to use the Entity Framework. If you have Visual Studio installed, the link above will install any missing components. If you don't have Visual Studio, the link will install Visual Studio 2012 Express for Web. You can use Visual Studio 2013, but some of the required procedures and screens will differ. Open Visual Studio and create a new C# project named "ContosoUniversity" using the ASP.NET MVC 4 Web Application template. Make sure you target .NET Framework 4.5 (you'll be using enum properties, and that requires .NET 4.5). 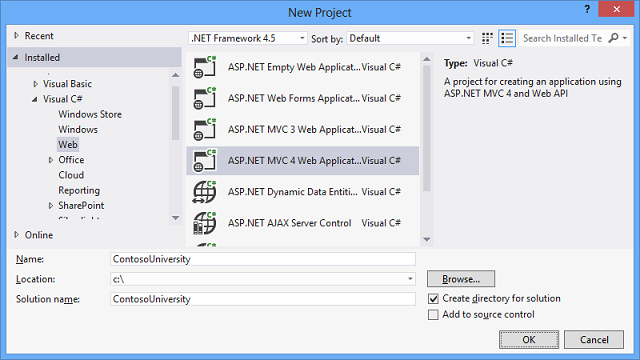 In the New ASP.NET MVC 4 Project dialog box select the Internet Application template. Leave the Razor view engine selected, and leave the Create a unit test project check box cleared. A few simple changes will set up the site menu, layout, and home page. Open Views\Shared\_Layout.cshtml, and replace the contents of the file with the following code. The changes are highlighted. 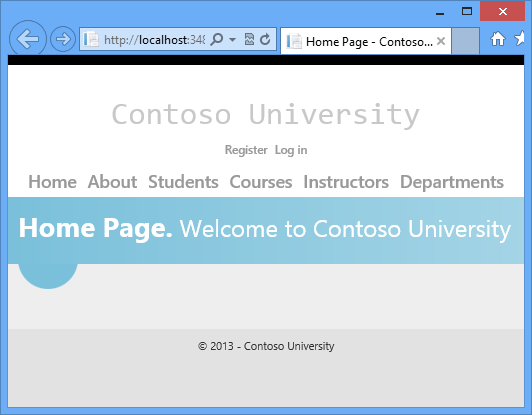 Replaces the template instances of "My ASP.NET MVC Application" and "your logo here" with "Contoso University". Adds several action links that will be used later in the tutorial. Press CTRL+F5 to run the site. You see the home page with the main menu. There's a one-to-many relationship between Student and Enrollment entities, and there's a one-to-many relationship between Course and Enrollment entities. In other words, a student can be enrolled in any number of courses, and a course can have any number of students enrolled in it. In the following sections you'll create a class for each one of these entities. If you try to compile the project before you finish creating all of these entity classes, you'll get compiler errors. The StudentID property will become the primary key column of the database table that corresponds to this class. By default, the Entity Framework interprets a property that's named ID or classname ID as the primary key. The Enrollments property is a navigation property. Navigation properties hold other entities that are related to this entity. In this case, the Enrollments property of a Student entity will hold all of the Enrollment entities that are related to that Student entity. In other words, if a given Student row in the database has two related Enrollment rows (rows that contain that student's primary key value in their StudentID foreign key column), that Student entity's Enrollments navigation property will contain those two Enrollment entities. Navigation properties are typically defined as virtual so that they can take advantage of certain Entity Framework functionality such as lazy loading. (Lazy loading will be explained later, in the Reading Related Data tutorial later in this series. If a navigation property can hold multiple entities (as in many-to-many or one-to-many relationships), its type must be a list in which entries can be added, deleted, and updated, such as ICollection. The Grade property is an enum. The question mark after the Grade type declaration indicates that the Grade property is nullable. A grade that's null is different from a zero grade — null means a grade isn't known or hasn't been assigned yet. The StudentID property is a foreign key, and the corresponding navigation property is Student. An Enrollment entity is associated with one Student entity, so the property can only hold a single Student entity (unlike the Student.Enrollments navigation property you saw earlier, which can hold multiple Enrollment entities). The CourseID property is a foreign key, and the corresponding navigation property is Course. An Enrollment entity is associated with one Course entity. The Enrollments property is a navigation property. A Course entity can be related to any number of Enrollment entities. We'll say more about the [DatabaseGenerated(DatabaseGeneratedOption.None)] attribute in the next tutorial. Basically, this attribute lets you enter the primary key for the course rather than having the database generate it. The main class that coordinates Entity Framework functionality for a given data model is the database context class. You create this class by deriving from the System.Data.Entity.DbContext class. In your code you specify which entities are included in the data model. You can also customize certain Entity Framework behavior. In this project, the class is named SchoolContext. This code creates a DbSet property for each entity set. In Entity Framework terminology, an entity set typically corresponds to a database table, and an entity corresponds to a row in the table. The modelBuilder.Conventions.Remove statement in the OnModelCreating method prevents table names from being pluralized. If you didn't do this, the generated tables would be named Students, Courses, and Enrollments. Instead, the table names will be Student, Course, and Enrollment. Developers disagree about whether table names should be pluralized or not. This tutorial uses the singular form, but the important point is that you can select whichever form you prefer by including or omitting this line of code. LocalDB is a lightweight version of the SQL Server Express Database Engine that starts on demand and runs in user mode. 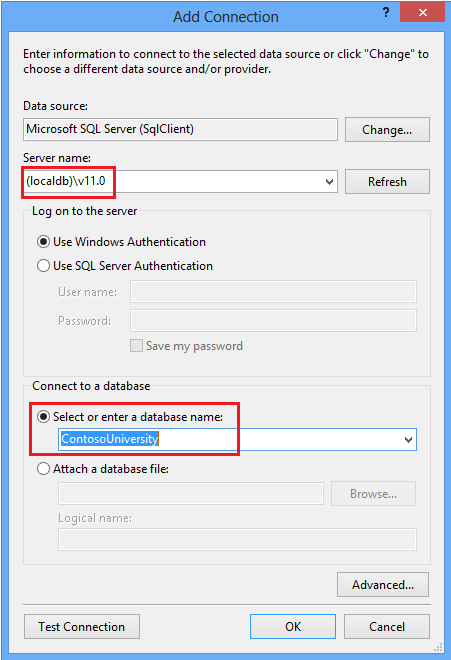 LocalDB runs in a special execution mode of SQL Server Express that enables you to work with databases as .mdf files. Typically, LocalDB database files are kept in the App_Data folder of a web project. The user instance feature in SQL Server Express also enables you to work with .mdf files, but the user instance feature is deprecated; therefore, LocalDB is recommended for working with .mdf files. Typically SQL Server Express is not used for production web applications. LocalDB in particular is not recommended for production use with a web application because it is not designed to work with IIS. In Visual Studio 2012 and later versions, LocalDB is installed by default with Visual Studio. In Visual Studio 2010 and earlier versions, SQL Server Express (without LocalDB) is installed by default with Visual Studio; you have to install it manually if you're using Visual Studio 2010. By default, the Entity Framework looks for a connection string named the same as the DbContext class (SchoolContext for this project). 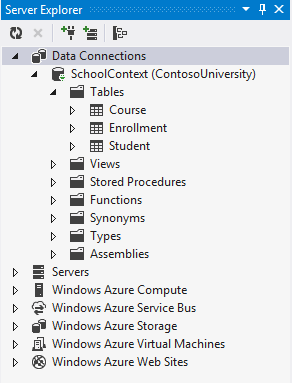 The connection string you've added specifies a LocalDB database named ContosoUniversity.mdf located in the App_Data folder. For more information, see SQL Server Connection Strings for ASP.NET Web Applications. You don't actually need to specify the connection string. 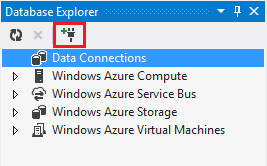 If you don't supply a connection string, Entity Framework will create one for you; however, the database might not be in the App_data folder of your app. For information on where the database will be created, see Code First to a New Database. The connectionStrings collection also has a connection string named DefaultConnection which is used for the membership database. You won't be using the membership database in this tutorial. The only difference between the two connection strings is the database name and the name attribute value. When you first start to develop an application, your data model changes frequently, and each time the model changes it gets out of sync with the database. You can configure the Entity Framework to automatically drop and re-create the database each time you change the data model. This is not a problem early in development because test data is easily re-created, but after you have deployed to production you usually want to update the database schema without dropping the database. The Migrations feature enables Code First to update the database without dropping and re-creating it. Early in the development cycle of a new project you might want to use DropCreateDatabaseIfModelChanges to drop, recreate and re-seed the database each time the model changes. One you get ready to deploy your application, you can convert to the migrations approach. For this tutorial you'll only use migrations. For more information, see Code First Migrations and Migrations Screencast Series. 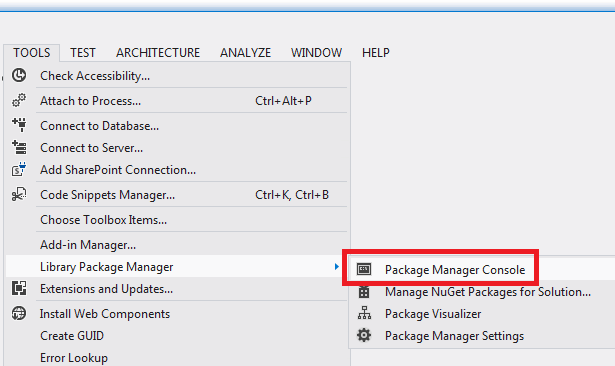 From the Tools menu, click NuGet Package Manager and then Package Manager Console. 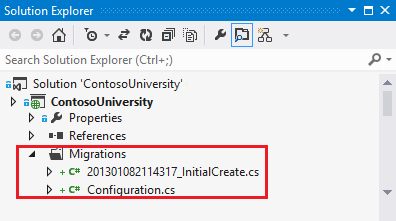 This command creates a Migrations folder in the ContosoUniversity project, and it puts in that folder a Configuration.cs file that you can edit to configure Migrations. The Configuration class includes a Seed method that is called when the database is created and every time it is updated after a data model change. The purpose of this Seed method is to enable you to insert test data into the database after Code First creates it or updates it. The Seed method runs when Code First Migrations creates the database and every time it updates the database to the latest migration. The purpose of the Seed method is to enable you to insert data into your tables before the application accesses the database for the first time. In earlier versions of Code First, before Migrations was released, it was common for Seed methods to insert test data, because with every model change during development the database had to be completely deleted and re-created from scratch. With Code First Migrations, test data is retained after database changes, so including test data in the Seed method is typically not necessary. In fact, you don't want the Seed method to insert test data if you'll be using Migrations to deploy the database to production, because the Seed method will run in production. In that case you want the Seed method to insert into the database only the data that you want to be inserted in production. For example, you might want the database to include actual department names in the Department table when the application becomes available in production. Replace the contents of the Configuration.cs file with the following code, which will load test data into the new database. Some of the statements that insert data use the AddOrUpdate method to perform an "upsert" operation. Because the Seed method runs with every migration, you can't just insert data, because the rows you are trying to add will already be there after the first migration that creates the database. The "upsert" operation prevents errors that would happen if you try to insert a row that already exists, but it overrides any changes to data that you may have made while testing the application. With test data in some tables you might not want that to happen: in some cases when you change data while testing you want your changes to remain after database updates. In that case you want to do a conditional insert operation: insert a row only if it doesn't already exist. The Seed method uses both approaches. This code assumes that last names are unique. If you manually add a student with a duplicate last name, you'll get the following exception the next time you perform a migration. For more information about the AddOrUpdate method, see Take care with EF 4.3 AddOrUpdate Method on Julie Lerman's blog. The code that adds Enrollment entities doesn't use the AddOrUpdate method. It checks if an entity already exists and inserts the entity if it doesn't exist. This approach will preserve changes you make to an enrollment grade when migrations run. The code loops through each member of the EnrollmentList and if the enrollment is not found in the database, it adds the enrollment to the database. The first time you update the database, the database will be empty, so it will add each enrollment. 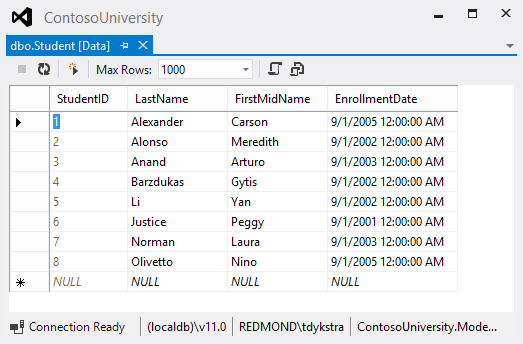 For information about how to debug the Seed method and how to handle redundant data such as two students named "Alexander Carson", see Seeding and Debugging Entity Framework (EF) DBs on Rick Anderson's blog. The add-migration command adds to the Migrations folder a [DateStamp]_InitialCreate.cs file that contains code which creates the database. The first parameter (InitialCreate) is used for the file name and can be whatever you want; you typically choose a word or phrase that summarizes what is being done in the migration. For example, you might name a later migration "AddDepartmentTable". The update-database command runs the Up method to create the database and then it runs the Seed method to populate the database. A SQL Server database has now been created for your data model. The name of the database is ContosoUniversity, and the .mdf file is in your project's App_Data folder because that's what you specified in your connection string. You can use either Server Explorer or SQL Server Object Explorer (SSOX) to view the database in Visual Studio. For this tutorial you'll use Server Explorer. In Visual Studio Express 2012 for Web, Server Explorer is called Database Explorer. From the View menu, click Server Explorer. Click the Add Connection icon. 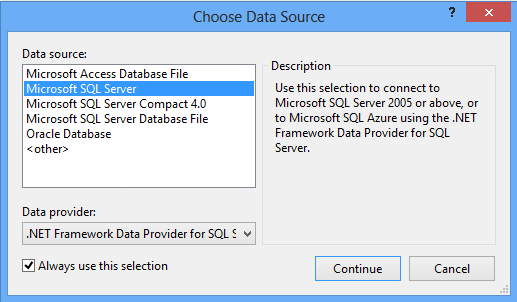 If you are prompted with the Choose Data Source dialog, click Microsoft SQL Server, and then click Continue. In the Add Connection dialog box, enter (localdb)\v11.0 for the Server Name. Under Select or enter a database name, select ContosoUniversity. Expand SchoolContext and then expand Tables. Right-click the Student table and click Show Table Data to see the columns that were created and the rows that were inserted into the table. The next step is to create an ASP.NET MVC controller and views in your application that can work with one of these tables. 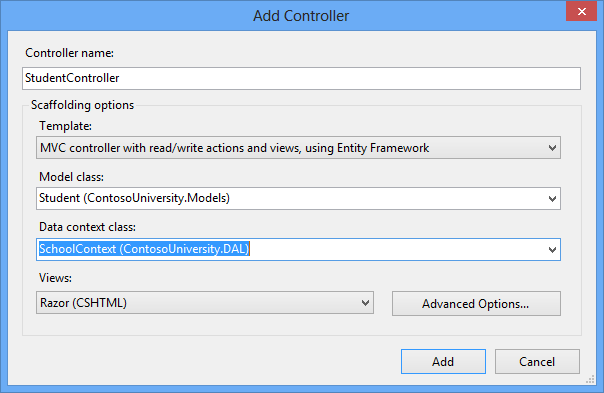 Template: MVC controller with read/write actions and views, using Entity Framework. Click the Students tab to see the test data that the Seed method inserted. The pluralized forms of entity class names are used as table names. Entity property names are used for column names. Entity properties that are named ID or classname ID are recognized as primary key properties. You've seen that conventions can be overridden (for example, you specified that table names shouldn't be pluralized), and you'll learn more about conventions and how to override them in the Creating a More Complex Data Model tutorial later in this series. For more information, see Code First Conventions. You've now created a simple application that uses the Entity Framework and SQL Server Express to store and display data. In the following tutorial you'll learn how to perform basic CRUD (create, read, update, delete) operations. You can leave feedback at the bottom of this page. Please let us know how you liked this portion of the tutorial and how we could improve it.